Apocalypse Vape Juice 30 ML: 80-20 (VG/PG) by VG Vapour: so I get a call telling me about this fantastic new, UK made, e-juice; all with wonderful familiar flavours and just so good. I am a bit 'OCD' so I try them alphabetically. The first one? Dragonfruit and cream: How British is that? Off to a good start then, but to be fair, I really enjoyed it. I have never tasted Dragonfruit so I can't vouch for its authenticity but I can tell you it hits the spot and tastes just so good. 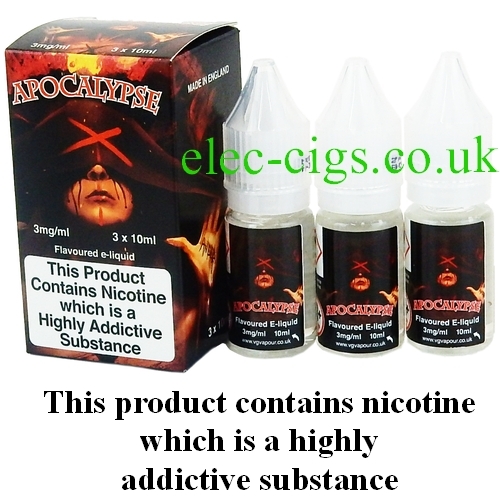 Apocalypse Vape Juice 30 ML: 80-20 (VG/PG) by VG Vapour is a British made e-liquid which is fully TPD compliant. It arrives in 3 x 10 ML plastic dispensers, neatly enclosed in a decorative cardboard box.. It is an 80-20 (VG/PG) mix and comes in two nicotine strengths: 3 mg (0.3%) and 6 mg (0.6%). A great juice from a great range which produces great cloud. 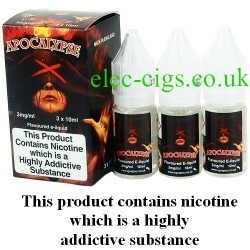 Apocalypse Vape Juice 30 ML: 80-20 (VG/PG) by VG Vapour can only be purchased by persons aged 18 years of age or older. This product contains nicotine which is a highly addictive substance.